Within the Risk window, Risk Templates hold the risk definitions for simulation accounts. A risk definition holds the amount of margin needed per contract, it also limits the amount of contracts allowed to trade. A Risk Template is a collection of risk definitions that can be used by Simulation accounts to track the amount of Margin being used. Risk Templates can be applied via the Control Center or Account Data Accounts tab. Note: Risk definitions are activated as soon as the template is applied. However, there are some values (i.e., Intraday margin, Initial margin, Maintenance margin) which are calculated only as the position is updated. Should you be in a position when the risk template is applied, these values would NOT calculate until the position is updated. You can force this calculation by disconnecting and reconnecting to your data account connection. If your desired session risk settings are not found within the pre-loaded Risk Templates, you can create a new template. 3.Select "add" to add a new risk definition, see "Understanding risk definitions" below for more information. Repeat for as many risk definitions as required. 4.Press the Apply button to save the configured session times in the Risk Template. A saved Risk Template can be selected via the Template section to the left of the Risk window. Selecting the template will allow you to configure individual risk definitions for that template. •Left mouse click the "copy" button in the templates section and insert a new template name to copy the current Risk Template. •Left mouse click the "remove" button in the templates section to delete the selected Risk Template. Each risk definition applies to an individual instrument. You can only have one instrument definition per instrument. 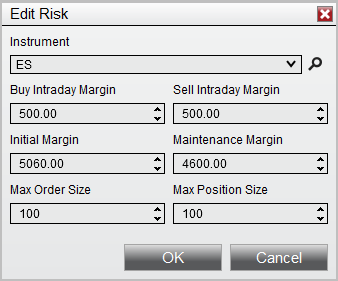 Sets the intraday margin required for buy orders. Sets the intraday margin required for sell orders. Sets the initial margin required. Sets the maintenance margin required. Sets the max allowable order size. Sets the max allowable position size.